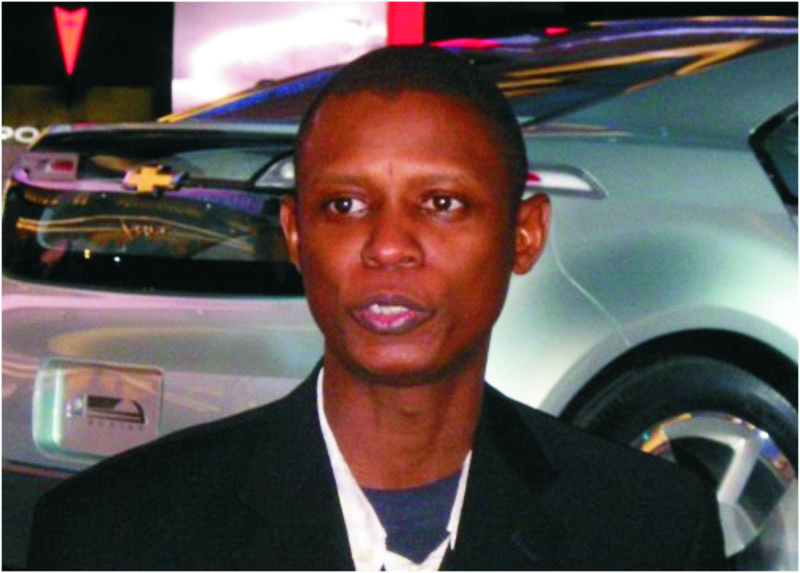 Mr Jelani Aliyu, the Nigerian Designer who produced “GM’s most electrifying advanced technology vehicle, the Chevrolet Volt concept, a battery-powered, extended-range electric passenger vehicle” will be finally honoured by his country. According to a news report (see number 136): Mr Aliyu will be conferred with the national award of Member of the Federal Republic (MFR) by President Goodluck Jonathan of Nigeria. The post below (first published in February 16, 2010) answers the above question. Watching Jelani Aliyu’s documentary on YouTube was edifying, for the simple reason that it breaks every mould. Jelani is not the typical soft-selling star that are foisted on our sight by the sleazy press. He is a northerner (from Sokoto State), a Muslim, he grew up in Nigeria, left the university to complete his studies in a polytechnic and above all his just secured the future for General Motors by creating Chevy Volt. He certainly does not fit any labeling. What I find rather strange is the chilling silence on Aliyu’s story in Nigeria media. Trawling through the links, Mr Aliyu’s discovery was reported in 2007 in NVS and The Daily Triumph. I cannot but agree with Michael Oluwagbemi’s The Nigerian Who Designed an American Car that the nauseating attitude of not exalting industry but rather prostrating to mediocrity is a national malaise. Mr Oluwagbemi was incensed by the inability of our press in celebrating Jelani Aliyu’s success and I concur with him. Obviously Aliyu breaks the stereotype of ‘the goro-chewing Northerner’ – a picture which we have been feed to believe in. Asides I wonder who will dare add Aliyu into US terrorist list? If we also accept the pigeonhole that all Muslims are necessarily on jihad, then one will certainly have a hard time with the auto designer. That’s how Jelani Aliyu broke the first mold. I have always maintained that we don’t all have to attend a university. In civilised economies, very few make it to a university while the majority attend a polytechnic or a skilled school. This fact in itself is not a measure of each person’s ‘success’; because highly-skilled workers earn more than the so-called intellectuals. Jelani Aliyu has broken mold number two, by abandoning a degree in Architecture from Amadu Bello University, Zaria and rather electing to study for a lower diploma in architecture from the Birinin Kebbi Polytechnic. His passion was so grand that he could not find satisfy it within a theory-driven university environment. Mr Jelani Aliyu triumph also illustrates the Nigerian spirit to excel despite all odds. The fact that we may be saddled by a putrid and clueless leadership should never preclude the people’s potentials. The American auto revolution was propelled by a Nigerian car designer. I can only congratulate Mr Aliyu for breaking all moulds and for producing “GM`s most electrifying advanced technology vehicle, the Chevrolet Volt concept, a battery-powered, extended-range electric passenger vehicle”. Mold number three, most Nigerians are not yahoo, yahoo. Jelani’s rare accomplishment should break so many molds at Nigerian and global scales. But then, not even such feats can eliminate streotypes. Molds are products of incurable bigotry and lack of education and exposure. Although it atimes seems like even those with the best schooling do indulge in putting down others on primodial bases,such bigots are infact only literate,but not educated. One is a skill, the other is attitude. Stereotypes or not,nothing can take away achievements of this kind made by Jelani. He has made his state,country and indeed,humanity proud. Snr Jelani Aliyu, Your achievements may seem extra ordinary to many people but those that knew you from your elementary school days have continued to say, that the world and indeed humanity have not really seen much of you yet and that this is just the beginning of many more creative works from you. For those of us from your alma mata we say a big congratulations to you on your discovery and conferment of MFR on you by the Federal Government of Nigeria. This sky is just the beginning for you. Nigeria and indeed the whole world is really proud of you. This goes to the press such achivement would not be seen on our tvs and in the dalies. Nigerians are making waves outside this country and if not for the national awards nothing will be heard. jelani u are GREAT. I got this email and I think it’s worth sharing. he’s surely a symbol of hope to many Nigerians here.I am a car designer here in Nigeria too hoping that someday I’ll get to meet him because he’s my mentor.As a car designer here,I got limitations. advise me… were can i lean automobile Engineering in lagos. evnin @ Otache kentbiller, kindly contact Me on 08037479719. Mr Jelani Aliyu U are an hero & made us proud but our country has lost his dignity to foreing nations , i think Nigeria need a switch ! My god reward him for his effort. I regards u jelani for all the efforts and u will be great forever!!!!…….. We are highly pround of u carry on Mr jelani,Oneday our nation will need ur contribution for technological advancement. Mr Jelani Aliyu Sokoto you are Great. Hello,Mr,Jelani Aliyu,I am very proud of you ,keep up the great achievement you started and you have make Nigeria proud and the youth will be looking up to you.